Chris Reddy – Official Chess Olympiad 2014 Artist at work Video! Hello chess blog friends, this is a lovely chess video featuring official artist of the Tromso Chess Olympiad 2014 - Chris Reddy. The 2014 Chess Olympiad art cooperation has received 250,000 NOK (30,000 EUR) from one of the main partners, SpareBank 1 Nord-Norge. We are extremely proud to have Chris Reddy on board as the official artist of the Chess Olympiad! He is an exciting artist who will have an influence on the Chess Olympiad and the city – before, during and after the 2014 Chess Olympiad. This will strengthen the Olympiad’s identity and reputation, and turn the players’ and visitors’ stay in Tromsø into a special experience. The cooperation is between the 2014 Chess Olympiad, Reddy and KIIL Arts Facilitator, his management. KIIL Arts Facilitator recently received the 250,000 NOK from SpareBank 1 Nord-Norges’ cultural business foundation – to highlight the Chess Olympiad through Reddy’s art. The artist is from Tromsø and is now based in Norway’s capital Oslo. 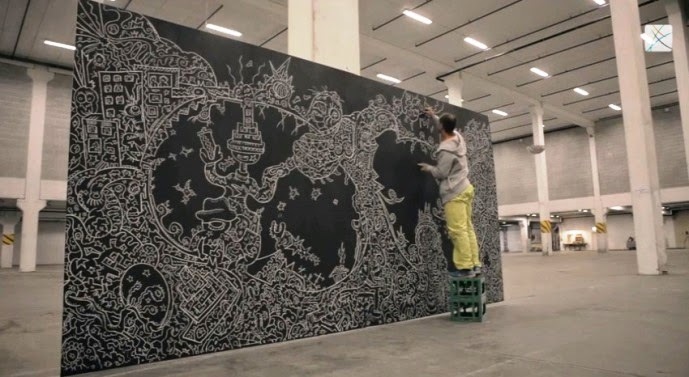 He draws on various surfaces and composes music, all called ‘Reddymades’. Reddy has an impulsive approach and a lively expression – which corresponds extremely well with the Olympiad’s values: smart, playful and warm. I want to bomb Tromsø with a visual expression, which those who are there during the Chess Olympiad can either love or hate. Chess is art and art is chess. Art and chess have a closer connection than chess and sport. You need input of all types in order to achieve a good output. Just-for-Laughs Chess Prank YouTube Video!